Home to the NBA’s Utah Jazz, EnergySolutions Arena opened in 1991. Prior to the 2013-14 season, Miller Sports Properties (which owns the team and arena) announced plans to install a new center-hung HD LED video display, four auxiliary upper-deck LED displays, two LED fascia boards, vomitory signage, and new courtside kick-plate displays. Previously, EnergySolutions Arena housed a 10- x 10-ft. SD board. The new center-hung display, manufactured and installed by Utah-based YESCO, is seven times larger. Twin 1080p HD screens stretch 42 ft. along the length of the court and measure 24 ft. high, bookended by two 720p HD screens facing each baseline, measuring 26 ft. wide and 17 ft. high. Two additional screens are located within the structure for the benefit of courtside fans. Back in June, we announced plans to put in a new video-display system as part of $15 million in renovations for EnergySolutions Arena,” said Frank Zang, VP Communications, Miller Sports Properties. “It debuted here in October, [and] the video screens have been a roaring success. Opting for a collaborative approach to the makeover process, the Jazz tapped Click Effects in Nashville, TN to power the arena’s new LED displays, Alpha Video Sports to design the control room, and Anthony James Partners in Richmond, VA to serve as technology consultant.Click Effects designed, programmed, and configured the team’s content-delivery system, selecting three single-channel CrossFire HD systems, two dual-channel CrossFire HD systems, six Blaze systems, a Click Effects Data Hub storage system, three BackDraft systems, and four Vista Spyder X20-808 systems. 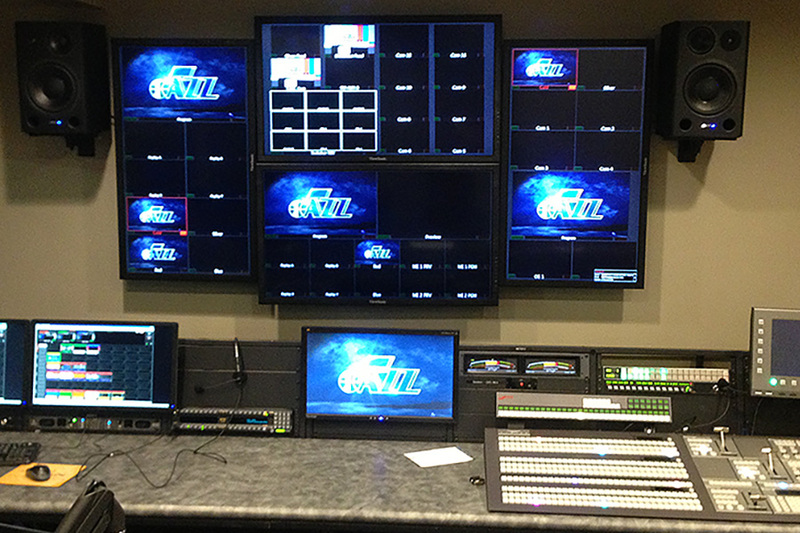 The combination of gear enables the Jazz to feed broadcast-quality effects to its various LED displays, layer multiple images and graphics, offer moments of exclusivity to sponsors, and more. We believe our fans are number one in the NBA, and their number-one request to us has been to improve our video capabilities,” says Zang. “Our existing system had been in there since 2001. We basically increased the viewing pleasure of our fans from 400 to 2,900 sq. ft.
Alpha Video integrated the venue’s sixth-floor HD control room, which is nearly three times as large as the previous room. In addition to integrating Click Effects’ gear into its design, Alpha Video added a Ross Video Tridium switcher and XPression character generator, Utah Scientific router, Tightrope Media Systems ZEPLAY replay system, and Ikegami cameras. EnergySolutions Arena completed its revamped video-display system prior to the 2013-14 season. The project also included an upgraded audio system to complement the video, producing high-quality sound for Jazz games, concerts, and other arena events. It’s truly changed the way people are experiencing games in our arena,” says Zang. “It takes a best of both worlds in the sense that it’s an atmosphere where you want to be in the arena because of the enthusiasm and energy of the live action but you also get that HD home experience now as well with the super-size screens.